Hi Jack and other forum members. Thanks for the invite on CF Jack. After having worked aboard drill ships for Big Oil, I've become a proponent of anything that replaces fossil fuel. It started with a modified electric scooter that I competed with the gas scooters with great success. It then progressed to a modified Cushman stakebed 3 wheel truck running (9) 8 volt 165 ahr golf cart batteries. Later I purchased an electric Smart Car and recently finished an electric kayak powered by (8) 100 ahr LiFePO4 cells. This is 64 lbs of lithium cells and in a efficient kayak is good for the entire shoreline of Lake Tahoe (about 75 miles). My next project is going to be a solar-electric gas outboard hybrid. Bond Yachts in Poland makes a very light and efficient 30' power catamaran that due to the hull's displacement efficiency is able to reach 27 kt on just (2) 60 hp outboards. On a single 60 hp outboard can cruise at 15 kt at 3/4 throttle. My rough calculations conclude it would be capable of 5 kt on just 1500 watts, also confirmed by Motorcat (Bond Yachts) when they used a MinnKota rated at 1500 watts, so at that speed works out to 300 whr per nm. My idea is to replace one of the gas outboards with a electric outboard, tilting the unused unit out of the water. (15) 100 watt flexible solar panels would produce enough energy on a sunny day for 5 hours @ 5 kt, 25 miles. The investment in LiFePO4 cells would be modest, (16) 100 ahr cells in series for an additional 17 nm range total of 42 nm. This may not seem like much, but it could get you to the Bahamas for some serious cruising. Weight with this setup won't be an issue because the panels that I have sourced weigh 4 lbs per panel, so only 60 lbs. Same for the batteries, since I'm not going with a lot of energy storage, those (16) 100 ahr cells weigh 112 lbs. I can easily enjoy 3 months a year cruising throughout the Bahamas, moving 40 miles every other day. Under electric/solar power that would negate a $700 gas bill per cruising season. In a PDQ 34, the old king of fuel economy would burn through over $2000 for those 700 miles. Now onto payback of the hybrid investment. Since the Motorcat 30 is already the least expensive to operate offshore capable power boat on the market, this is why (besides weight) I won't be putting together a lithium bank capable of 100 nm on its own. At a slow cruise of 12 kt, the basic boat manages 6 nm per gallon, or at Bahama gas prices of $6 per gallon, $1 per mile. Cost of those (16) panels $3000, but considering I'll be cooking and BBQ with electric, there is savings there. 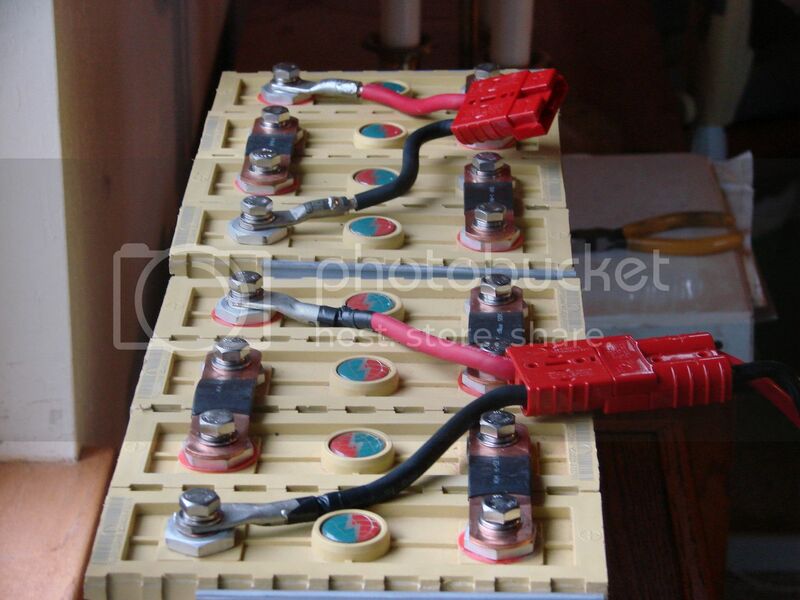 $1750 for the (16) 100 ahr LiFePO4 cells, total investment to go green $4750. Less than a 7 year payback, but quiet cruising would be worth it for me regardless. The thing I haven't spec'ed yet is which electric outboard. They are all expensive and each has pros and cons. 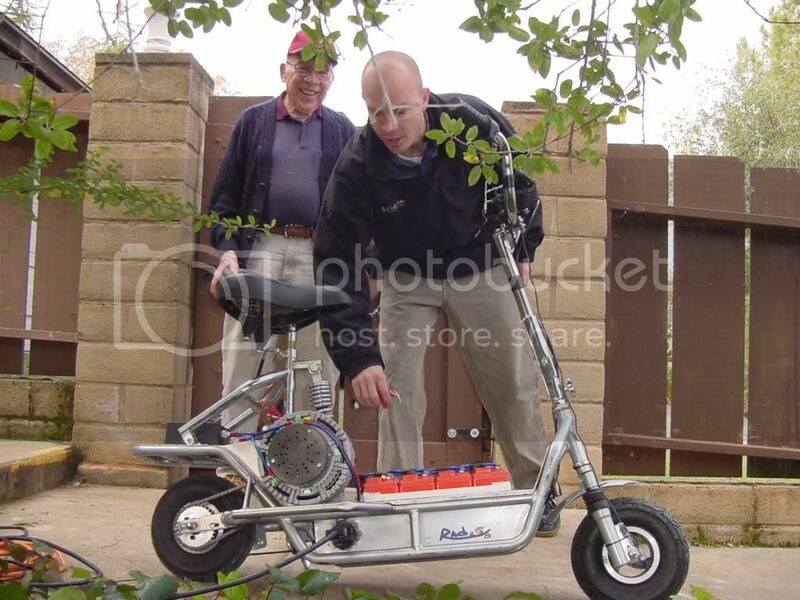 The scooter, powered by an Etek and (4) Odyssey PC680 AGM batteries in series for 48 volts. Controller is good for 400 amps, so 400 X 48 = 19,200 watts / 746 = 25.7 hp. If this scooter was a rodeo bull, it would have a perfect record as I've allowed 5 friends/family to ride it and even with a thorough preflight all have lost control of it. The LiFePO4 cells used in the kayak. see a good review of all of them. That would be difficult as they are all pretty expensive. We should get a thread going on electric outboards, they are always of interest.